Delta Green knows. Things from beyond space and time that lurk and titter in the shadows, the slow rot at the core of humanity, the dark stars that whirl madly above - these are the true masters of the world. Delta Green has been fighting since the 1928 Raid on Innsmouth, and the fight still rages on. Inside you'll find a secret history of the 20th century and the movers and shakers who are players in the game: Delta Green, the outlaw conspiracy working inside the U.S. government to fight the darkness; Majestic-12, the clandestine agency that cuts deals with aliens and reports to no one; SaucerWatch, a UFO study group closer to the truth than they know; the Harotechnia, immortal Nazis who serve a risen Hitler; and the Fate, an occult syndicate that knows where the bodies are buried. The book that started it all! 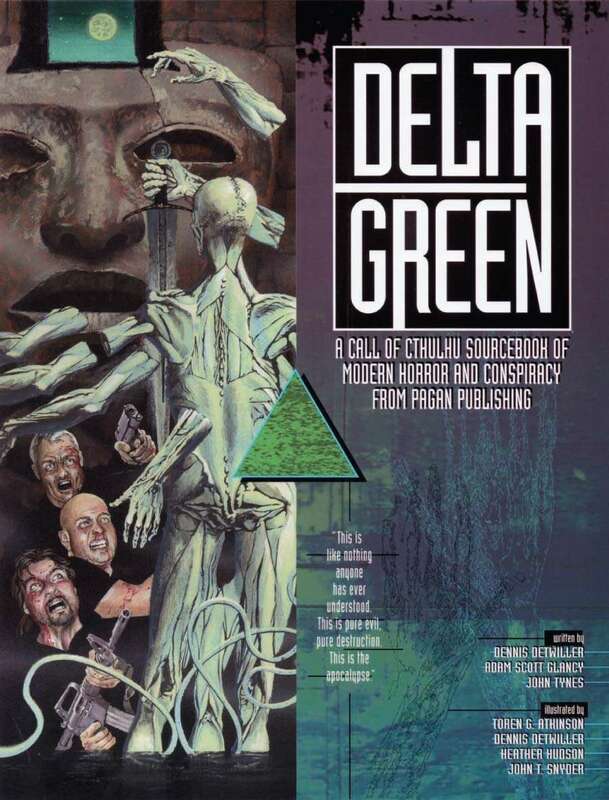 Five years in the making, DELTA GREEN won the Origins Award for Best Roleplaying Game Supplement of 1997 and has received unanimous critical praise. Delta Green tells the story of the Cthulhu Mythos in the modern age. Conspiracies abound, and this is one of the deadliest: Delta Green is a handful of men and women who use the resources of the government to fight a secret, illegal--some would say treasonous--war against monstrosities which threaten their world. This is a massive 1990s sourcebook dealing with government conspiracies, alien activity, undead Nazis, and much more. Which version of Call of Cthulhu does this mesh with? It was designed for the 5th edition, although there is a version that includes d20 statistics; this would appear to be the former. How's the quality of the printed book? I ask because I would love to get this but it has a warning about it being from a scan and I know how rough those can be. Anyone gotten one yet? I just got mine in the mail yesterday and I am pretty pleased with it. It is not perfectly crisp (most noticeably in areas where the text originally had highlighting) but still very readable. Certainly better than paying twice as much for the original printed book online.